Vietnam War memorial in Westminster, California. Photo courtesy of Flickr. Ethnic enclaves are commonplace in the United States, but this announcement felt like an epic diplomatic triumph against all odds, because it put the name “Saigon” back on the map. Several months after the city fell to the communist North Vietnamese Army in April 1975, Saigon was renamed Ho Chi Minh City, after the communist revolutionary leader. In Westminster, surrounded by flags no longer flown in Vietnam, most of the 400 Vietnamese-American attendees, well aware of the external intervention necessary to preserve their exiled collective memory, were elated to finally see their former capital city’s name on a road sign. “Only in America is Saigon being resurrected,” said local politician Van Tran. It was perhaps only in a place like Westminster, a town of less than 100,000 located just minutes from Disneyland, that “Little Saigon” could become a reality and sustain itself well into the post-Cold War era, with its culture and memorials dedicated to a conflict that most Americans would rather forget. Tran’s statement, while true, would have been unthinkable 15 years prior, before refugees transformed the 9000 block of Bolsa Avenue from a mostly white, semi-rural strip into the unofficial capital of the Vietnamese diaspora. Just as importantly, in American culture at large the very idea of “Vietnam” had been consigned to the Dark Age of American history, so that refugees had to be careful celebrating even benign occasions like the Tet lunar new year on U.S. soil. Little Saigon’s social history speaks volumes about the complex bonds and activism at the local level in Orange County that were needed to build and maintain an ethnic enclave synonymous with exile politics. But by 1988, with the blessing of the governor, Vietnamese Americans were suddenly in a position to transform a local celebration into a symbolic statement suggesting that maybe they really had won the Vietnam War. Or at least its aftermath. These nominal losers of the war itself had learned to affirm a tragic past by rewriting it. In their own way, they were simply becoming American. We normally don’t associate exile politics with becoming American, thinking of refugees as sojourners rather than settlers. But the history of the Cold War made the fusion of exile and American identity totally feasible and virtually inevitable. This fusion resulted from a decision by the United States—starting with the 1948 Displaced Persons Act—to defy the international community by defining refugees in such a narrow way that 90 percent of those admitted during the Cold War hailed from communist republics. In their classic book Calculated Kindness, Gil Loescher and John Scanlan argued that such a strict admission policy was politically designed to highlight global disapproval of the Soviet way of life. It also had an impact domestically. Since the vast majority of refugees from Soviet Bloc countries were adamantly anti-communist themselves, they were free to write their own pre-Cold War national histories onto their new American lives. Ukrainians, the single-largest beneficiary of the 1948 Displaced Persons Act, befriended Columbia University history professor Clarence Manning, who wrote nine books on their pre-Soviet culture. It took only eight Hungarian Americans to successfully petition the Denver city council in 1963 to dedicate a park to those who perished in the short-lived revolution of 1956. Because of the politics of Cold War migration, it did not take long for Florida’s Cuban population to become ideologically homogeneous. That the United States operated anti-communist media like Radio Martí that employed some Cuban refugees made it clear that there was no contradiction between being an exile and becoming American. By the time the Vietnamese refugees arrived in mass in 1975, a pattern was established whereby entire ethnic enclaves functioned as transnational opposition parties to America’s communist adversaries. Because Cold War tensions poisoned most attempts to establish formal diplomatic ties with many communist states, refugee communities could often proudly and publicly espouse their claim to the lost homeland with near impunity, protected not only by the First Amendment, but also the unofficial blessing of Uncle Sam. Thus, these Cold War traditions led to generations of Vietnamese in the refugee diaspora standing at attention to a flag, an anthem, and other symbols no longer associated with an existing nation-state. They could be assured that hardly any Vietnamese or Americans would point out the contradiction. For a nascent neoconservative movement in the United States, regime change replaced détente as the foreign policy objective. During his 1976 bid for the presidency, neoconservative upstart Ronald Reagan audaciously met in Florida with exile leaders from Panama and Cuba hoping to plot another invasion of the Bay of Pigs. Though he failed to win his party’s nomination that year, Reagan’s hardline rhetoric pressured the incumbent Gerald R. Ford administration to jettison any plans to normalize diplomatic relations with the Hanoi government. After the Cold War ended, exile politics shifted—and were reinvigorated—by a new threat: Globalization was transforming Little Saigon into Little Ho Chi Minh City. The refugees still had numbers in their favor, especially with the influx in the 1990s of more than 100,000 former political prisoners from Vietnam. But they had to contend with a post-Cold War world in which Vietnam had become America’s newest trading partner. In liberal-leaning Seattle and Boston, Vietnamese political prisoners longing to enjoy in exile the cherished cultural symbols and practices banned in their home country were met with disappointment. The history of the Cold War made the fusion of exile and American identity totally feasible and virtually inevitable. The shift in politics became clear in 1995 when Westminster attempted to erect a Vietnamese-American Veterans Memorial. 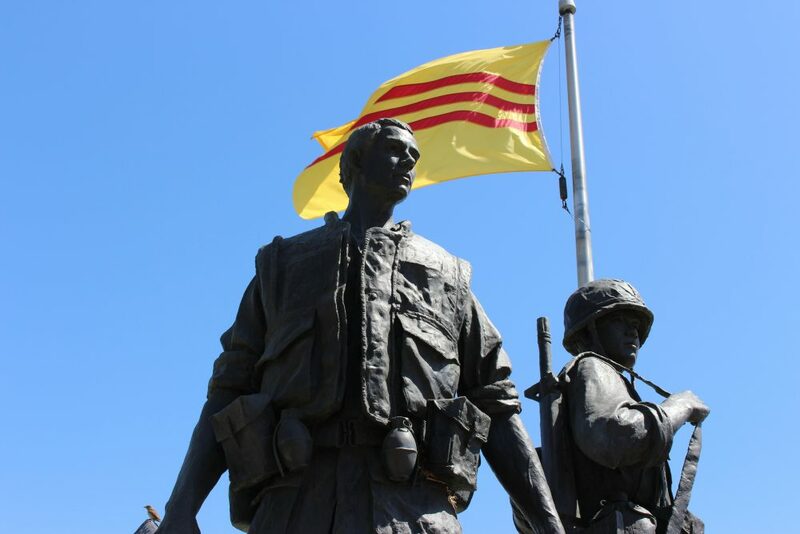 It was Westminster city councilman Tony Lam, famous for being the first American elected official of Vietnamese descent, who proposed building a special statue to honor the sacrifice of both American and South Vietnamese soldiers during the war. Internal divisions among Vietnamese people in the city stalled the project. Then the Anglo population was reluctant to get behind a project that placed Vietnamese soldiers—whom most Americans collectively remember as inadequate allies at best—on an equal footing with the U.S. military. Ironically, Frye’s reputation for such politically incorrect statements gave the new plans for the memorial a boost when, as Mayor of Westminster in 1996, he embraced the project and began convincing white conservatives that it was a good idea. When a protest against a shop owner who displayed a photograph of communist hero Ho Chi Minh energized the Vietnamese community, it became the impetus for a series of concerts to raise the $1 million for the project. But once the Hanoi government demanded that the city erect a statue featuring American and North Vietnamese (i.e. communist) soldiers shaking hands in the spirit of reconciliation, the city council dropped its objections. Whatever problems that conservatives whites had with rewriting the past to portray South Vietnamese as equal partners with the United States were trivial compared to a much more radical rewriting of the past depicting Americans soldiers and communists seeing eye to eye. And this was but one expression of how refugee identity was not a refusal to assimilate, but rather another way of becoming American. In this case, a refugee American. Phuong Tran Nguyen is an Assistant Professor of History at California State University, Monterey Bay and the author of Becoming Refugee America: The Politics of Rescue in Little Saigon (University of Illinois Press, 2017). He was born in Vietnam and migrated to the United States a couple of years after the end of the Vietnam War.